UN Secretary-General Ban Ki-moon´s Special Envoy for SE4All, Kandeh Yumkella, is striving to supply every human being with access to energy until 2030, that is: environmental friendly and secure energy. So, he has taken on quite an enormous task - considering the fact that 1.2 billion people still lack access to sustainable energy at all. In an interview with KfW Development Bank Yumkella explains why he thinks it is important that this goal is reached within the envisaged time frame. Energy for all sounds quite intriguing as an objective but is it also realistic given the present lack of it? Kandeh Yumkella: I admit it is quite an ambitious objective but not impossible to reach. We can do it. And we have to do it for several reasons: Sustainable energy is the golden thread that connects economic growth, social equity and climate protection. In other words: Energy is THE major factor of the 21st century that will grow economies, achieve the development goals and at the same time leave the climate intact. In fact providing sustainable energy for all could be the biggest opportunity of our times. Therefore it has to become a solid part of the development agenda. And in order to do so it needs a solid institutional framework. At this point the energy agenda has no institutional home within the United Nations. It is dealt with in many UN constituencies but not in a single, consolidated one. When you talk about a solid institutional framework do you have an international energy organization in mind? Yumkella: In the long run I think the UN needs an energy entity because that is the only way you can raise enough support for 15 or 20 years. It has to be an institution, however, that allows private sector involvement next to governmental initiative because we need its cash and knowledge. The level of investments required cannot come entirely from governments. Since the structure of the UN does not allow private involvement just like that I recommend a kind of a hybrid institution. What this will look like exactly is for the member states to debate. But we definitely need an institution that will track Sustainable Development Goal number seven, which is energy. How many countries support your idea of a separate UN-organ for energy matters? Yumkella: It´s one of those issues where everybody wants to go to heaven but nobody wants to die: Everyone wants sustainable energy to be enhanced but the minute you talk about an entity member states are worried about the contributions. On the other hand, when we started the energy lobbying some years ago we did not think it would go anywhere. Back then member states did not even want to talk about energy. And look where we are now. We have an SDG, we have a narrative and governments coming along. So, we are progressing but we have to take it step by step. How much money is necessary for sustainable energy everywhere? Yumkella: The investment has to be huge, 50 billion additional dollars per year just for access, for energy efficiency between 300 and 350 billion dollars annually. For renewables we need another 200 to 250 billion dollars each year. That is an enormous amount and can only be raised with the private sector. Governments have to start out, set the rules and the general framework for that kind of transition and stimulate the markets by subsidy incentives. Once all that is created the private sector has to take over. We need this coalition of public initiative and private engagement. Apart from the finances what are some other limiting factors? Yumkella: Clear answer: Storage will be the game changer for energy systems. If we crack the storage problem it will definitely drive down the cost. And that way we solve the intermittency problem, which means we can integrate renewables anywhere anytime. Secondly, it means any consumer can put up his or her solar panels, store energy and maybe even sell the extra. So, storage is the decisive factor. If we solve the storage problem and lower the cost we can democratize energy. That´s our ultimate goal because in the end energy is about people, a fact we must never forget. We want to humanize energy. Is the sinking oil price working against your agenda? Yumkella: The low oil price is indeed a problem for our agenda. That is why we need a coalition of the committed and leave it not to the market alone. Take four or five countries like Germany, Japan, China, India and others that want to join in. Get them committed to sustainable energy with their combined technological and their huge market power - and the price for renewables will sink quickly and have others follow. But we need that kind of pioneering coalition. How do you assess Germany´s role here and how could developing countries benefit from its energy transition? Yumkella: Germany is a pioneer in many ways. The switch towards renewable energy sources and increased efficiency it is undertaking presently will demonstrate to the world that no matter how big the economy, it can be run in a much more environmentally friendly and sustainable way than in the past. It is developing the necessary technologies and it shows that green economies can indeed create jobs and spur economic growth. However, for developing countries to be able to follow Germany´s example these technological innovations need to be made available to them. Otherwise we won´t be able to reach the target of universal energy access. And we need that access to build sound economies, particularly in Africa. The Interview was conducted by Friederike Bauer. 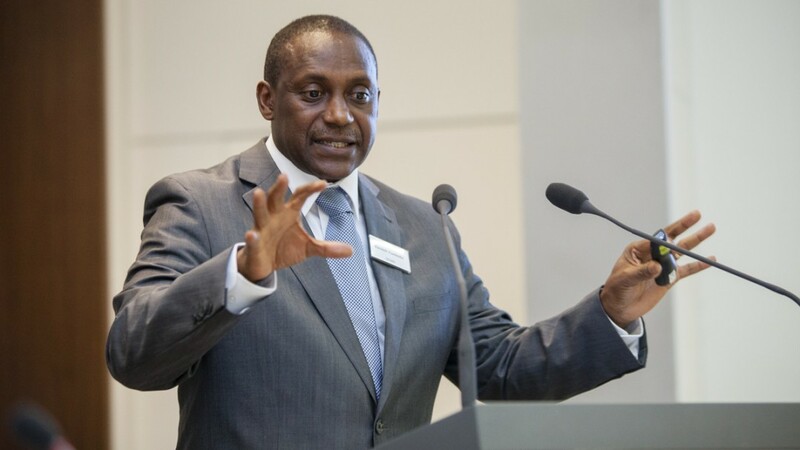 Kandeh Yumkella, UN Under-Secretary-General and Special Envoy for Sustainable Energy for All (SE4All) says: "We want to humanize energy".